Anything is Possible, Dude. Mets in World Series. A Queens Lager while Eating Bao Buns in Sunnyside. 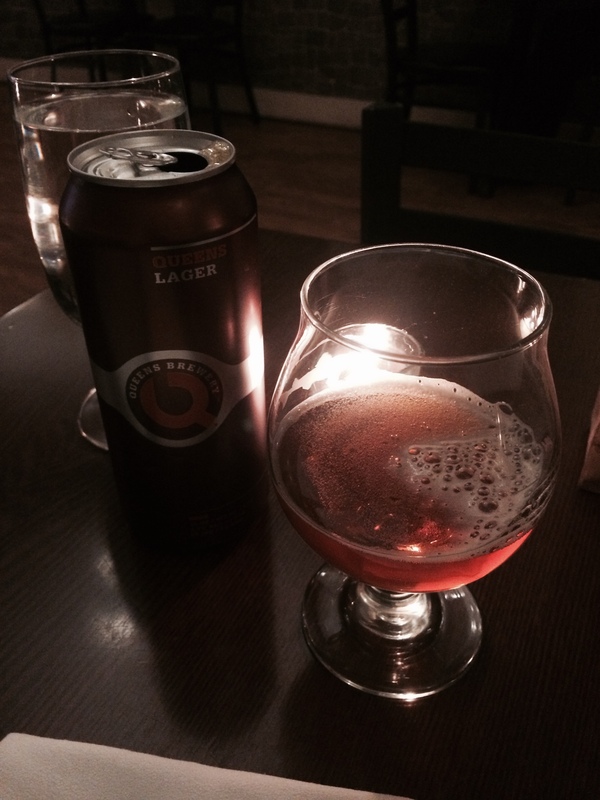 #Kidfromqueens discovered Queens Lager while eating at Salt & Fat during last inning of Sunnyside Restaurant Week. 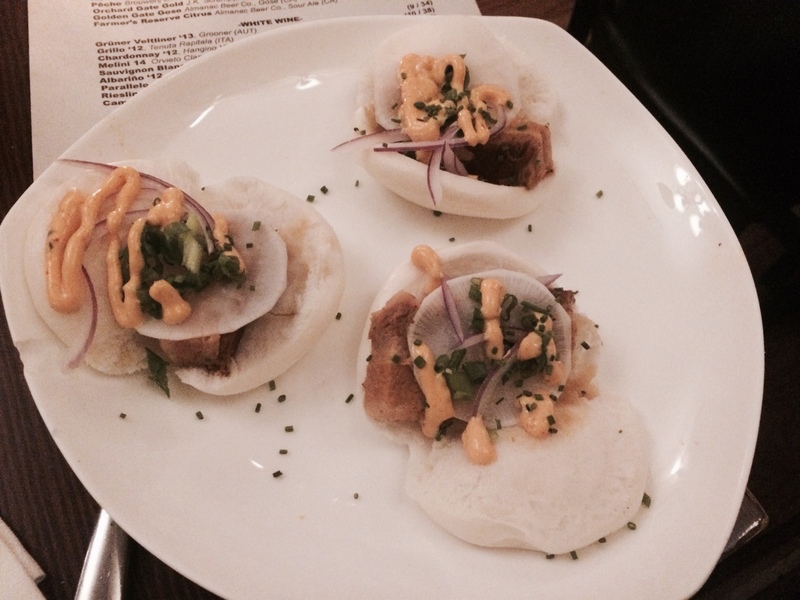 How did Queens Lager go with a Bao Bun? Imagine Flores to Murphy to Duda for a double play. Whoa, baby. Take a look at that Queens bred lager. A light brown color with a white head. Not too carbonated. At first you’ll think it’s flat, then you realize that’s its edge. Starts off like Granderson in the lead off spot and finishes like a Familia third strike. Who needs another bottle of beer? Queens Brewery is straight from a 16 ounce can. Now, mind if we talk Salt & Fat? Listened to Miles and popped that popcorn in our wanting mouth while taking in the art work on the restaurant’s beige walls before their 18 tables filled. The art work is yours for the taking if you’ve got the buckaroonies and it’s impressive,too. Sunnyside Restaurant Week concluded on Friday, October 23rd so you’re going to have to wait for the next one to come around. Three courses for $25 at 29 local restaurants. 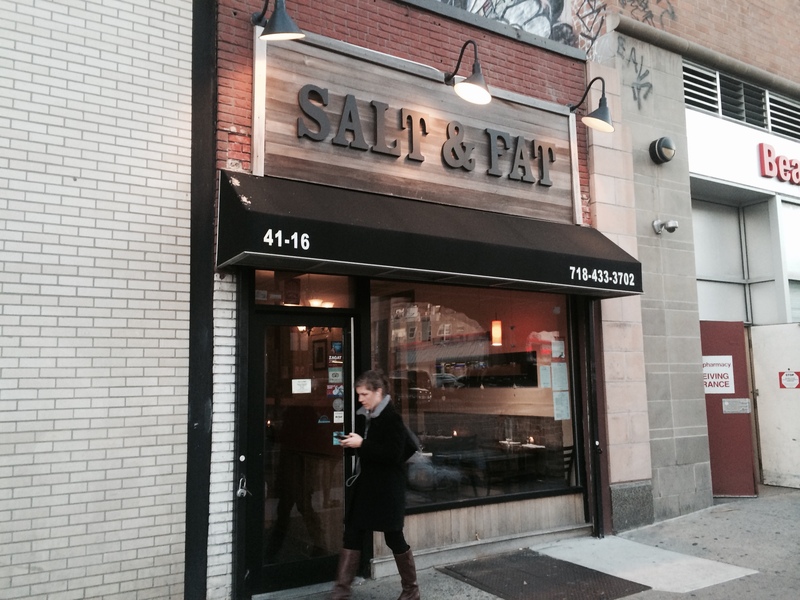 Salt & Fat lacks a bar and television, so if you do go to Salt & Fat, you’re going to look a little odd hoisting a Queens Lager and shouting ‘Let’s Go Mets,’ while raving about those Bao Buns. Sometimes a wrong turn leads to a good ale. Wasn’t paying attention, Kiddo. Right turn off Queens Plaza North. A block screaming Quentin Tarantino. A bevvy of auto body shops. Cars jacked on sidewalks. ‘Flat Fix Here’ signs everywhere. Roar of cordless drills tightening wheel nuts. And then? Quick glance to the left. Garage door half opened. People sitting at wooden tables on steel stools. Sheet metal ducts run the high ceiling. Wooden casks along the brick walls. Silver silos at far end of room. An immaculate stainless steel basin in a room behind a glass window. Exotic bottles of beer on the window ledge. Not far away people, toss bean bags at wooden boards. Welcome to the LIC Beer Project, Kiddo. Open six months. A former tobacco holding factory. Ten taps. All Belgian style ales. Maybe a poet gave each ale its name and wrote the descriptions. You like poetry Kiddo, right? So, linger, ok? There’s space. Seven seat sleek bar. Pandora selections loud and clear through hidden speakers. List of ale’s on a vintage mirror above the taps. Customers stare at the mirror with the focus you give a menu at a four-star restaurant. “What are you going to have?” the bartender asks. Major league tattoos, red hair, and knows her stuff. You tell her your likes. She looks at the taps. Bites her top lip. “Got just the one for you,” she says. The ale is finished. You put money on the bar top. The bartender thanks you and says to come around again. Outside on 23rd Street, a cordless drill goes back to work. A red sky appears above the Queensboro Bridge and a woman leans against the brick wall near the entrance to the LIC Beer Project. She bends one knee and presses the sole of her shoe against the wall. A goblet filled with an ale in one hand. Cell phone and cigarette in the other. The electric drill goes silent. Wheel nuts hit the sidewalk. Tears well in the woman’s eyes. Her lip quivers. She sips the ale and looks away. Punch Zip Code 11101 into Waze. Get yourself to The Paper Factory Hotel in Long Island City. Enter the hotel’s lobby. Up the stairs and a quick right into Mundo. A restaurant/bar like nothing you’ve see in Queens. Wow meets Swank. Blocks from the Queens Plaza subway and just off Northern Boulevard. Arriving at Mundo for the first time is like channeling Giovanni da Verrazano upon his discovery of New York Harbor. Ninety-four years ago, the building at 37-06 36th Street housed a couple of companies. One manufactured radio parts. The other functioned as a paper mill. Today, the site is home to a 122 room hotel and a restaurant/bar that serves cocktails with names like L’al, Mateina, and Zen. But, the real Zen lies with the site’s real estate developer. Kudos to Gal Sela. He brought the property in 2012. Put $27 million behind the renovation and hit the bullseye. Achieving goals? Don’t put down Sela if he shouts B-I-N-G-O. As for Mundo? It’s like something you’d expect to see inside The Salvador Dali Museum in Figueres, Spain. Multicolored Turkish gourds wired with electricity provide light above Mundo’s twelve seat bar. A thirty foot column swathed with books. Candles on tables. An industrial ceiling and leanforwardbabyIwanttotellyousomething friendly acoustics. Got a light? Turkish gords wired like never seen before above Mundo’s bar. Seven specialty cocktails. Five white and red wines by the glass and maybe more on some nights. This visit it’s a Portillo 2014 Malbec from Argentina. Deep red color. Scent of plums and blackberries. Starts smooth and finishes like a John Coltrane solo, which is to say memorable. ($11/glass). Friday glass of wine? How about a Portillo 2014 Malbec from Argentina? Two sips into the Portillo and your eyes wander. Round high top tables with leather stools in middle of room. Brown rectangular tables along the side of the room, in front of a vast window. The window’s covered with something like lattice. You feel like you are in a foreign country. White and red lights of cars driving Northern Boulevard cut through the lattice and give the room a distinct look. Sit inside Mundo. Look beyond the room’s windows and you’ll never think of Northern Boulevard the same again. In time, the customers fill the bar. Collars up. Cellphones in hand. Info: Mundo is located on lobby floor inside The Paper Factory Hotel. M at 36th Street Station on Northern Blvd. Parking: Metered parking near hotel. Free parking along surrounding blocks. Vernon Jackson Avenue Subway. One stop from Grand Central, yet a different state of mind. It’s the Saturday after Christmas. You get off the subway at Vernon Jackson Avenue. The streets are empty. Everyone you know is away. You want a glass of wine before going home. You see a neon sign. ‘Wine Bar’ above a black awning. You open the door. Ain’t no simple wine bar, babe. It’s Domaine Bar A Vins, but you won’t know that until you step inside. Wine Bar to some. Domaine Bar A Vins to others. Steps from Vernon Jackson Subway Station. Bordello like lighting with white Christmas lights running length of bar. Red lights above piano in back corner. Something like a strobe light twirls near a ceiling fan. Red, white and green light flashes bounce off the walls. Ten seats at a zinc bar. Seven tables along the walls. Wooden blinds on the front windows. The music is crisp and loud. You ask whose playing. “Isaac Hayes,” replies the barkeep. French accent. Brown PorkPie Hat. Muscular arms. He brings over the wine menu and a candle. Bevy of topflight red wines. Excellent selection of white wines. Sparkling wines and Champagnes. Port and Sweet Wines. Imported beers and one beer on tap. A small menu that includes cheese, oysters, sliced meats and Pate de Campagna. But, you’re not in the mood for food. Isaac Hayes gives way to young Stevie Wonder. You order a glass of Malbec. Domaine Basquet, 2015. ($11.00) Deep red color. First sip is lush. Sends you right to Stevie’s voice. You break down the wine. You think berries. It’s got a richness and a scent that’s almost like lavender, but some might argue otherwise. Half way into the Malbec one of the women gets up to use the bathroom. The other woman doesn’t waste a moment. She puts her arms around the guy and pulls him close. Gold medal PDA. It grinds to a halt when the women comes out of the bathroom. Gilberto Gil takes over for Stevie Wonder. The barkeep pours a second glass of Malbec. It’s a farewell party, of sorts. One of the women is splitting for St. Louis. The other is making wedding plans. The guy lifts his glass of Prosecco. He stares at the piano and that’s when the glass of Malbec at Domaine Bar A Vins becomes a memory burn. First note in you realize the guy’s got talent and shouldn’t have passed up Julliard to crunch numbers. By the time he hits his first chord you know exactly what’s on his mind. And yes, you’re of the same state of mind. The LETLOVE Inn. A corner bar in Astoria that spins vinyl records and features live music on Monday and Tuesday nights. The LETLOVE Inn bartender is in a mood. “Think I’m going to play a vinyl,” Mike said. The guy is screen ready, but you don’t say anything.Tall,slender with heart shaped tattoo on forearm. Spike runs through the heart. Mike’s got a voice that’s memorable. Years ago sang in a Baltimore choir. Somewhere between a soprano and baritone, he said. Every tattoo has got a story. Mike, the barkeep at The LETLOVE Inn displays his tattoo. So, he walked to far end of the bar. Pulled out a vinyl and walked right passed you. You sip your Caravan ($12) cocktail. One of The LETLOVE Inn’s six specialty cocktails. This one is composed of Date infused bourbon, Kas Spiced Honey Liquor, pomegranate, lemon, cardamon bitters on the rocks and garnished with a sprig of rosemary. Funny thing is it tasted like a hyped up Whiskey Sour. The after work crowd chilled. Women sat together showing photos off their phones. A couple of guys sat by themselves and decompressed from their subway ride. The LETLOVE Inn is a comfortable corner bar. Low on decor. Spacious floor. Long enough to swing somebody around on a Monday or Tuesday night when The Platt Forms and Subtonic Three perform. Low level lighting. Candles on bar. Think a Humphrey Bogart movie. Except instead of some guy in a trench coat you’ve got Hipsters and locals. Heads down. Eyes fixed on their phones. The mahogany bar is long enough with enough seats so nobody’s complaining. A couple of tables along the walls and a Christmas tree in the corner near the front door. Need anything more from a corner bar? Mike drops the toner arm on the vinyl record and the song’s first beat gives you a good memory. Yo Mike, you want to say. Didn’t see that pick coming. “Love Me Do,” by The Beatles. Two minutes later, Beatles get to the final chorus and your Caravan cocktail is finished. Still time left on the clock. He poured a PNW Mahogany Ale from Single Cut Beersmiths. Guinness like color. Less of a head. A product from Astoria’s first microbrewery, if you must know. Single Cut Beersmiths is located on 37th street with an address prefix of 19-33. Ring a bell? Nineteen thirty – three just so happens to be the year Prohibition ended. This is what you need to know about Single Cut Beersmiths Mahogany Ale: One taste in and you go “wow.” Memorable. A blend of flavors that goes together like John, Paul, Ringo and John.